Today I am so happy to welcome Chonce Maddox of My Debt Epiphany for our next installment of the Intersectional Women’s Finances Series. 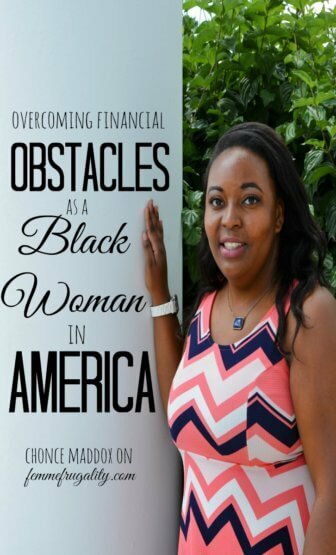 Today Chonce will share with us her experiences with finances as a black woman in America, including overcoming generational poverty and combating the wage gap–twice. Growing up I was always told that I had to work twice as hard and be twice as good in order to be successful. As a black woman in America, I learned about racism, stereotypes, and this nation’s horrific past as I aged. I never thought much about how being a black woman affects my finances until I started becoming more conscious about improving my financial situation. The gender wage gap is something I used to pretend didn’t exist. When I entered the workforce, I didn’t like to talk about money or earnings as I thought it was unprofessional. When I got a job, I didn’t negotiate or even question my starting rate because I didn’t want to be seen as greedy or unappreciative of the opportunity. According to a study conducted by the American Association of University Women (AAUW), black women made 63% for what non-Hispanic white men were paid in 2015. This means that it can take a black woman nearly 8 extra months to be paid what the average white man earns. When I landed my first job out of college, I started out earning $28,000 per year. I was the only woman in the office. Even though I liked my boss and he seemed fair, I couldn’t bring myself to ask my white male coworkers what they were earning to see if I was being compensated fairly. Instead, I made sure I spoke up for myself and earned my worth. Each year, my boss gave each employee an annual review and offered a pay raise. I made sure I came prepared to negotiate a higher hourly rate each year. As the popular saying goes, ask and you shall receive. Over the course of their careers, women lose out on $500,000 simply due to their failure to ask for a raise. Statistically speaking, men are usually better with money than women. But I believe that’s because some women lack financial confidence which can make negotiating and earning more difficult. 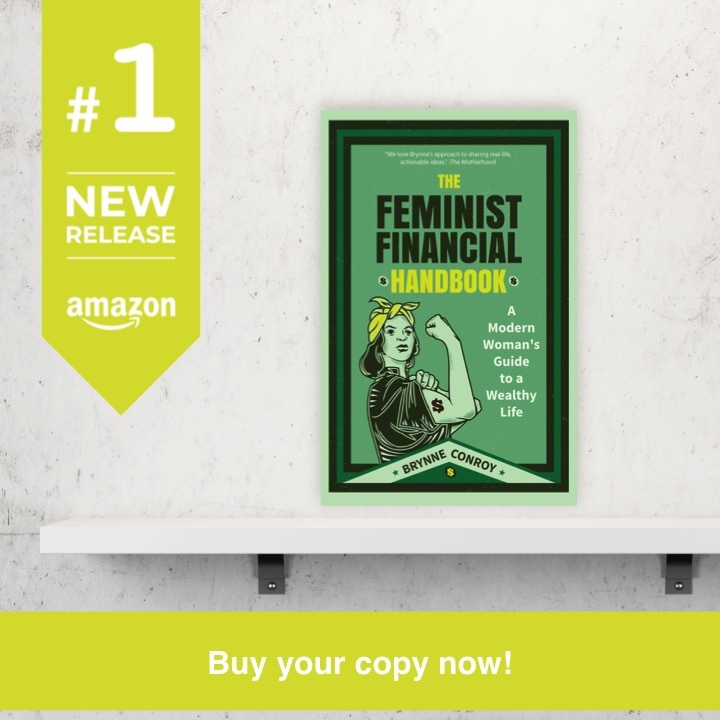 Note from Femme: Many of the financial planners I know confirm that their male clients tend to be more tuned in to investment strategies and building wealth than their female clients. It’s also interesting to note that we, as a culture, may be perpetuating this cyclical lack of financial confidence by the way we discuss these matters with our daughters. The gender and racial pay gap is messed up no doubt. But I know I can’t sit around not doing anything about it. I choose to speak up, back up my claims, and demand what I’m worth. Now that I work for myself, I have the freedom to charge clients whatever I want. Sometimes, it feels super awkward to ask for a raise or raise my rates, but I know it’s the right thing to do as the cost of living and inflation goes up every year. It was also a mindset shift I had to make. I knew that if I didn’t start earning more, I would never break out of generational poverty. My parents grew up in the inner city. Their parents didn’t have any wealth and couldn’t afford to send them to college so they didn’t go. My parents did a great job raising me as best as they could. But they worked blue collar jobs and couldn’t afford to financially fund a college education for my sisters and me as well. Honestly, I wasn’t expecting a full free ride to college but some savings would have been helpful. Instead, I knew I’d have to take out student loans. I was fine with it and knew it was necessary if I wanted to take a different approach to getting ahead. For minority groups with low wages, I feel like so much is at stake. For starters, it’s harder to save and invest when you aren’t earning as much as a man or someone as a different race. If you choose to go to college, you’ll likely have to take out student loans and it will be harder to pay them back upon graduation due to your low wages. Having low wages and taking longer to build wealth will really slow things down in terms of getting your nest egg in order and leaving something behind for your children to build on. Just look at how the average African-American household’s net worth compares to other races. In terms of black culture, it’s common for women to juggle household tasks, raise children, and maintain a full-time job (if not 2 jobs). Both my mother and mother-in-law work two jobs. I did, too, at one point. This is not specific to African Americans alone or even women for that matter, but it is more likely. According to research from the National Institutes of Health, historically, the labor force participation of Black women has been higher and more stable than that of White women. This doesn’t mean that black women are earning more, but it can mean more stress. According to the study, black women have not reached economic equity with other ethnic/gender groups and tend to be more stressed as a result of the burden. As a former single mom, I can relate to that stress. However, knowing these statistics and deciding to do something about it is what has allowed me to propel forward. I know I’m at a disadvantage and the odds are stacked up against me. There’s the gender and race wage gap along with discrimination in the workplace. However, I believe that there is more than one way to reach success. If I can’t get in by the front door, I’ll try the back door or the window. There are still many career-fields and opportunities for black women to succeed and improve their finances and I hope to explore more of them. This entry was posted in Think on February 15, 2017 by femmefrugality. I couldn’t help but notice this: “Sometimes, it feels super awkward to ask for a raise or raise my rates, but I know it’s the right thing to do as the cost of living and inflation goes up every year.” It’s also the right thing to do because you’re good at what you do, and your services are valuable – worth the higher rates. Congratulations, Chonce! Yours is the generation that will mark a significant change in your family history. Your son is very fortunate. This post really speaks to me. I never realized just how wide the gender wage gap was until I started my debt-free journey. I never dreamed of negotiating my pay because 1) I didn’t know it was possible and 2) I was afraid that the job offer would be taken away from me. I’ve started a job search for positions that align with my degree, and I am ready to start talking numbers. I know I am good at what I do and it’s time to start getting what I deserve…even as a black woman. I dont find it ironic that I started with the same starting salary as Chonce when I started my former job 10 years ago. Unlike Chonce, I never demanded a pay increase and by time I left the company my salary was only $8,000 higher. I knew I was being underpaid but I didnt rock the boat because they were allowing me to work from home. As a result, I didnt have to do daycare for my son. Just recently they wanted to pull me back in office, but I didnt want to change my lifestyle. That’s when I started questioning my pay and my worth and knew it was the right time to part ways. If I could do it all over again, Im not sure what I would do differently, but I commend Chonce for sticking up and going after what she earned! I am so excited for this next chapter of yours, Latoya! And I hear you on the daycare—$8,000 might be less than the costs. But not bumping the pay and moving into a traditional office? So happy for you that you’re taking this new path. “However, I believe that there is more than one way to reach success. If I can’t get in by the front door, I’ll try the back door or the window.” Your attitude is awesome! I’m so sorry you have so many extra hurdles, but I really do believe with that kind of attitude, you’ll knock them all right down. That line struck me, too. The wage gap definitely exists, so I am glad you are sharing these stories. The more we know, the more we can become empowered. Thank you! Such an important read, thanks for sharing. In reading ‘What Works for Women at Work’ recently, they did touch on the double whammy of gender + race bias, but not in much depth. (For black women, they noted the angry/aggressive stereotype, and for Asians, the quiet/passive stereotype – which does very much resonate for me as an Asian and does gel with my actual personality). Like you I find it so tough to self advocate and ask for more, but nobody else has our best interests at heart, so if we don’t, nobody will… My Asian background means I don’t shy away from talking about money generally but somehow when it comes to actual transactions I get SO awkward and I definitely missed the haggling/negotiating gene!